while others are running out. greater appreciation, honor, and respect for firefighters. We worship you, the Eternal Flame. Your holy fire purifies and cleanses. Through you, we are given life and life abundantly. We come today to thank you for our beloved firefighters who are daily alert to the ferocious fires that seek to destroy both life and property. Their bravery provides a loving canopy to our lives and our communities. Loyal and true, they stand ready to protect and defend from the burning disasters that target our loved ones, our homes, our small towns, our big cities, our farms, and our forests. As they daily stand guard waiting for calls of distress, draw them close to you and nourish them with heavenly blessings. As they rush to emergencies, riding on engines of mercy, prepare them for the unknown challenges that they will face. protect them on each fire call. After the fire has been quenched and they return to the station, we pray for refreshing times of rest. Each day, Lord, may your wisdom guide them, your encouragement uplift them, and your love comfort them. I lovingly lift up the firefighters of my community, and all the firefighters around the globe. As I think about firefighters, I think of bravery beyond comprehension. I stand amazed as I realize that they stand daily ready to lay down their life for strangers. These incredible men and women give their all to protect us. Lord, I come to you this day asking that you generously shower on them, and on their families, miraculous blessings of every kind. 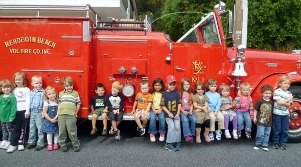 I know that young children love to go to a firehouse! like taking a trip to a fire station. the sights and sounds of heroes at work. with an adorable future firefighter! We lift up our firefighters in prayer. Whether the blaze is large or small, protect them on each fire call. I come today thanking you for providing protection for me through an amazing group of people. Today I feel so grateful for all the firefighters who are standing guard over me and over my community at this very moment. Their silent love brings me a peaceful security that I rarely ponder. Today, I ask that you would stand guard over them and keep them from harm. May your protection and encouragement be renewed daily for them and their families. our life on the line for another person. Yet firefighters are prepared to do that on a daily basis. the high cost of saving lives. their last day or the last day of a buddy. a home or someone's personal property. We ask that you would bless the firefighters who are reading this prayer. We ask that you would surround them with your protection, guide them with your wisdom, provide them with the best equipment, enable them to build strong teams, and encourage them with joyful camaraderie as they take care of tasks around the fire station waiting for distress calls. We pray that our local fire station would be a place free of strife and disputes. We ask that you would help the firefighters to keep it a warm place of harmony, peace, camaraderie, and good-natured fun. I teach fun-filled DISC personality seminars that help people reduce strife and increase harmony and team work. The way I teach DISC, it doesn't pigeon-hole anyone. It just brings understanding and acceptance of differences. I am available to do telephone seminars to help your teams. If you are interested, contact me by using the "contact us" page on this website. I invite you to go to Communication Keys to learn more.